So we have our RaspberryPi ready, with MinibianPi installed and secured. If you’re like me, there’s already a ton of ideas about what kind of systems I want to set up in my house, and this is just from browsing and reading some awesome blog posts. What many people forget is that when you’re about to jump into the “smart home” or “personal cloud” bandwagon, there’s one thing that I believe you should have ready from day one: a secure reverse proxy. I am by no means an expert in server installation or maintenance. I do this for fun, and sometimes I get lazy and cut corners. Please don’t treat this as a you-must-do-this guide, but more of a this-is-what-I-did and I’d like to share it with you. If you spot any mistakes, please let me know and I’ll do my best to address it immediately. I want to have a single point of entry for all inbound traffic for my internal systems, using a single domain (or subdomain). All other systems (running on the same RaspberryPi or another unit downstairs) will be assigned a “virtual directory”. I want to have all said inbound (and outbound traffic) encrypted using the strongest and latest cipher suites and have all reasonable optimization and security features enabled. I want to have all internal traffic to be sent in cleartext to reduce the load of encryption protocols on my internal systems, and have a termination proxy do all the encryption work. Your reasons may be different, and your mileage will surely vary. As with any tutorial you’ll find on this site, this is more of a “this-is-how-I-did-it” rather than “you-should-follow-my-example”. Proceed with your own considerations. That question will probably spark a debate longer than this article. I’ve heard that Nginx is much more lightweight than Apache, and more suitable as a reverse proxy. But don’t take my word for it. Googling “nginx vs apache” will get you situated. This build is based on my previous article on how to set up a secure MinibianPi-based server. It’s up to you if you need as much security as I do. Previously, we’ve put a firewall in place that will only allow SSH connections. We’ll have to change it so that it allows HTTP and HTTPS (ports 80 and 443) from anywhere to connect. Matt Wilcox has written an excellent article about this on his blog, but I’ll re-write the steps here anyway. At the time of writing, I used the latest, which is PCRE v8.35, OpenSSL v1.0.2, and Nginx v1.7.10. To be able to run the script, we need to make it executable. Let’s make it executable only for us and deny access to anyone else, because we’re paranoid like that. Now all that’s left is run the script. This will take about 20 minutes, could be more. If you want to grab a beer, now’s the time. After the build is done, check the output message and make sure that there are no errors. No errors? Great! Let’s open our browser and browse to the Pi’s address to check. If you see the Nginx welcome page, you’re all set. If not, recheck your build output, you might’ve missed something there. That’s it! Now you have Nginx installed and ready to use. But of course the vanilla installation always has loopholes that we must fix. Onwards! We could tune our Nginx installation to suit our needs. What I’m about to mention here are what I think would be beneficial for my setup. Your mileage will vary, so please take it with a grain of salt, do your research, and make an informed decision about your own setup. If you’re wondering, gzip_comp_level is how much compression we want. It accepts values from 1 to 9; 1 is the least compressed but fastest to compute and 9 is the most compressed but slowest to compute. With the limited power of our minuscule processor, I’m going with a middle ground value of 6. That’s all there is to it. Let’s proceed with configuring our website. This section assumes you already have dynamic DNS setup for your public IP address. If you haven’t got that setup yet, you can read my article on the topic and come back here to proceed. To encrypt communications between our server and the internet, we need to have an SSL certificate in place. I’m not going to go too deep into explaining what an SSL certificate is, because (1) I’m not that well-versed in cryptography and (2) this article is supposed to focus on the technicalities of implementing such encryption. If you’d like to know more, there are a lot of articles that you can read elsewhere. To obtain an SSL certificate, we must first create a private key. This key must be known to no other than ourselves and must be kept secret in a safe place, preferably off-site and offline, to prevent unauthorized access. But that’s for the big players. For us, safekeeping in a USB flash drive that’s not plugged in unless needed will probably be sufficient. I recommend replacing ‘mysite’ with the domain name the certificate will be issued for to avoid further confusion. The command starts the process of CSR and Private Key generation. The Private Key will be required for certificate installation. You will be prompted to fill in the information about your Company and domain name. It is strongly recommended to fill all the required fields in. If a field is left blank, the CSR can be rejected during activation. For certificates with domain validation it is not mandatory to specify “Organization” and “Organization Unit” -you may fill the fields with ‘NA’ instead. In the Common Name field you need to enter the domain name the certificate should be issued for. Please use only symbols of English alphanumeric alphabet, otherwise the CSR can be rejected by a Certificate Authority. If the certificate should be issued for a specific subdomain, you need to specify the subdomain in ‘Common Name’. For example ‘sub1.ssl-certificate-host.com’. I just used: mysite.com. Once all the requested information is filled in, you should have *.csr and *.key files in the folder where the command has been run. The *.csr file contains the CSR code that you need to submit during certificate activation. It can be opened with a text editor. Usually it looks like a block of code with a header: “—–BEGIN CERTIFICATE REQUEST—-” It is recommended to submit a CSR with the header and footer. The *.key file is the Private Key, which will be used for decryption during SSL/TLS session establishment between a server and a client. It has the header: “—–BEGIN RSA PRIVATE KEY—–“. Please make sure that the private key is stored somewhere safe and secure as it will be impossible to install the certificate without it on the server afterwards. There are a few options where we can get a signed SSL certificate. If you want to have a Certificate Authority sign your SSL certificate, you can apply for it at one of the Certificate Authorities. Just google “cheap ssl certificates” and you’ll get a list of candidates you might want to look at. I use one from GoGetSSL which at the time of writing costs $12.35 and is valid for 3 years. Just register at the provider of your choice and follow their instructions. However, keep in mind that you should never send your private key to anyone. Only submit your CSR. Either way, we should end up with a *.crt file in our hands, and this is what we will use to secure our server using SSL/TLS. Before we can use the certificate, though, we must chain it together with the CA’s certificates. Here’s a pretty good article on COMODO’s site on how to do that. After we have our certificate signed and ready, it’s time to configure Nginx to use those certificates. To make things easy to maintain, we’ll create another file that we will include in the main configuration file. The file will reside in the /etc/nginx/conf.d/ directory; Nginx is preconfigured to scan that location for additional configuration files. The list below will explain bit by bit what each setting will do. We do this to support TLSv1 as the minimum standard because anything below that would compromise our security. This will tell browsers to let our server decide what cipher suites to use throughout the session. 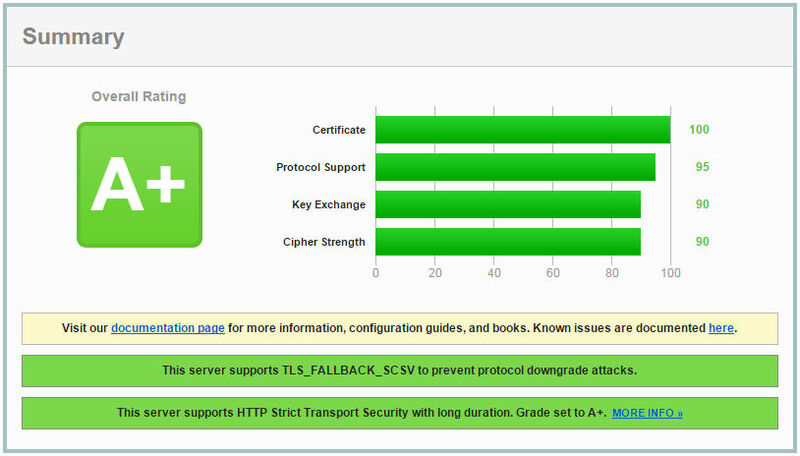 HTTP Strict Transport Security is a feature that will make browsers remember to always connect to our server using HTTPS. The first time a browser connects, it can use HTTP, but all subsequent connections will be “forced” to use HTTPS. The max-age here is set for 365 days (equivalent to 31536000 seconds). Mozilla recommends a minimum max-age of 6 months. OCSP Stapling is a mechanism to “staple” certificate information from our own server so that we can skip contacting the Certificate Authority every time we need to authenticate an encrypted connection. This has the benefit of not sharing any request details to the Certificate Authority (thus increasing our privacy) and relieving the Certificate Authority of precious clock cycles that it would otherwise have to provide to authenticate every request to our server. This tells Nginx to enable OCSP stapling and verification of OCSP responses, sets the location of our trusted certificates file, and configures Google’s public DNS as our resolver. Details of each setting can be found in the Nginx documentation. To use this feature, we must also prepare the comodo.trusted.pem file (COMODO is my CA, yours may be different). We do this by chaining all certificates like we did before except our entity certificate (the innermost certificate). add_header Public-Key-Pins "pins-sha256=[YOUR_PRIMARY_PIN_HERE]; pins-sha256=[YOUR_BACKUP_PIN_HERE]; max-age=15768000; includeSubdomains"
This should force all HPKP-compliant browsers to stop the SSL handshake if they detect that your public key has changed or been tampered with. The security settings are now in place and ready to go, so let’s save and close the file. Next, we’ll configure the Nginx virtual host to use HTTPS exclusively. Now, we’re ready to test it. Finally after all the security settings are in place (don’t forget to make copies of your private keys and store them somewhere safe! ), it’s time to test. I like to use SSL Labs to test my settings, and I suggest you do too. Just head over to https://www.ssllabs.com/ssltest/index.html and enter your domain there. If you spot anything out of place, they have a lot of articles that can help you address it appropriately. If you’d like to see the details of the test, just go over to SSL Labs and run a test on this website. Now we have a secured Nginx reverse proxy that handles all incoming HTTP and HTTPS requests. We can tweak these settings as we see fit, and as more internal applications need outside access, but the scope of this article stops here. As I write more articles based on this setup, I’ll update and post links in this section. So, stay tuned! A RaspberryPi isn’t the most powerful computer around, nor is it equipped to perform server-grade mission-critical tasks. But a lot of people use it as their home-grown server, some have multiple units or clusters of them, and some companies even offer RaspberryPi data centers. I’m a tinkerer. This means I make mistakes, I ruin one of my servers, and — more often than not — I re-install it from scratch because I don’t know how to fix it. Then I do it all over again. Setting up a base system that I can build on has become a somewhat mundane task. This post documents just that: my endeavor to create a secured minimum system from which I can build a RaspberryPi server. The objective of this build is to prepare a minimum system that is reasonably secured and can be used as a base system from which we can build a RaspberryPi-based server. Note the keywords: minimum and server. We won’t need to have a desktop environment, let alone Minecraft. Let’s leave all unnecessary things out of the build. To achieve the objective, I chose MinibianPi. It’s a stripped-down version of Raspbian which is quite up-to-date, and even supports Pi 2. I think it’s a great place to start. Write the image to an SD card (there are instructions for Windows users, Mac users, and Linux users). Login as root (password is raspberry), either directly or via SSH using Terminal if you’re on a Mac or PuTTY if you’re a Windows user. The image has SSH enabled by default. Install raspi-config. We could just re-partition the SD card ourselves, but I would personally try to not mess with partitions. Run raspi-config, and then expand filesystem. We have to do this now to avoid running out of disk space when we start installing other stuff. I believe this is one of the most important things to do, because the default ‘pi’ user on the Raspbian image is vulnerable enough if exposed to the internet, let alone having a system with a known root password. First we need to update our repositories. I found out the hard way that if we do this any later, some installations just won’t work. Next, we need to install sudo so that we can grant administrative privileges to non-root users. Alright, with that done, let’s add the new user. We have to set a password for this new user, but all other fields can be left blank. To grant administrative privileges, we can add USERNAME to the sudo group. With that done, we can reboot and login as USERNAME. The very first thing we need to do is regenerate the unique host keys. Next, we should prefer key pair authentication for SSH than the default password authentication. As long as we don’t lose our private key, that is. If you’re a Mac or Linux user, follow along. If you’re stuck with Windows, like I am, here‘s a good article about setting up key pair authentication using PuTTY. Change 192.168.1.2 to your Pi’s reserved IP address. After that’s done, our Pi will be able to authenticate us using our public key. To try this out, logout from your Pi and try to login again. Instead of the usual SSH login prompt, you will be prompted to enter your passphrase if you have one. If you didn’t set a passphrase, you’ll be logged in immediately. Set ‘PasswordAuthentication’ value to ‘no’. Set ‘PermitRootLogin’ value to ‘no’. Test by logging in without your private key, the attempt should be rejected. To protect against attackers who take advantage of open ports, we should install iptables and set our default firewall rules. For now, we’ll just block everything except localhost, network pings, and SSH on port 22. LOG all -- anywhere anywhere limit: avg 5/min burst 5 LOG level debug prefix "[NETFILTER] denied: "
Save, exit, nano, and make the file executable by root and not accessible by anyone else. Test by rebooting and checking iptables right after you’re able to login again. After doing this you should have all log messages having the prefix [NETFILTER] stored in /var/log/netfilter.log. NOTE: This build will eventually evolve into a server, which means we will need some more ports opened for our services to be able to function properly. When you have your services up and running locally but can’t access it from your network, just remember to check your iptables settings and make sure it’s not blocking your service port. Now the system is relatively secure and almost ready, but before we proceed with actually building the server, let’s upgrade everything first. That’s it, now we have a secured minimum system ready to build. What servers can we build from this starting point? That depends on your imagination. Enjoy! These articles are a good read if you’re into setting up your own RaspberryPi-based server. I believe they use the standard Raspbian Wheezy image for their tutorials, but most of the commands will run just fine. Please have a look at them if you’re interested in learning more. Meanwhile, I’ll be documenting my own endeavor to build my server based on MinibianPi (as opposed to standard Raspbian Wheezy).